1948 must have been a good year for the snowpack. 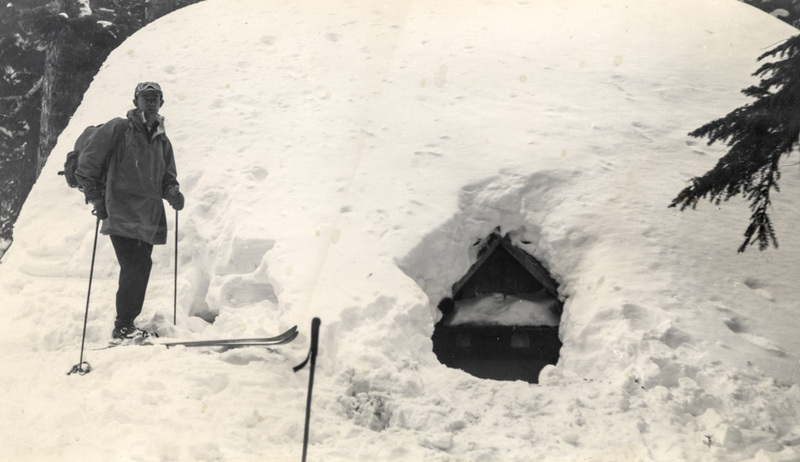 Here's Crag Rat Wayne Hill at the Tilly Jane hut in December, 1948. I'll bet the hut's snow load was more than 100 lbs per sq foot! Lots of snow that winter, when I was in the 1st grade. I am wondering if that is the actual door that in the summer you would walk into .If my memory serves me at all, my Dad spoke of a door or window way high up that you could dig into in the winter to get down into the cabin. I don't have a clue who Wayne Hill was. New name to me. I knew the winter of 1949-50 was bad. Didn't know about 1948. I looked up some Portland winter facts for snowiest winters. Of course, snow on the mountain could be totally different than what Portland received. From Dec. 1 to the end of February: 1948 is the 4th snowiest. By the way...this winter ranked #11. Yes, that's the front door. There's a kitchen window in the tiny opening next to the skier. Around the left side, behind the skier, is an upstairs hatch that enters into a sleeping loft, and there are steep stairs down from there. It's probably about the level the skier is at. When people first arrive after new snowfall, they unlock and enter the upper hatch, then climb down inside, open the front door and begin to shovel up to the outside from there. I am going to make a correction on the name of the man in the photo. His name was Wayne Lill, not Hill.The entire time I was looking at this photo something was back there in the cob webs of my mind, and turns out it was his name.